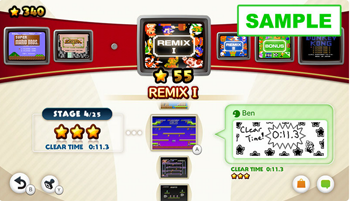 NES Remix contest participants used an exploit to reduce the time needed to complete a stage. Nintendo canceled a contest for NES Remix, a compilation of 16 NES games announced and released last month, after participants took advantage of an exploit to reduce their stage completion times. The Time Attack Challenge began last month as a promotion to the recently released NES Remix. Players competed for the quickest time to complete a stage in which they controlled two Mario characters at once. Director Koichi Hayashida revealed the contest the day after the game's release. Participants had until Jan. 2 to take a screenshot of their fastest time and post it to Miiverse. Thank you very much for participating in this event. Unfortunately, we confirmed that there is a way to exploit the challenge to achieve a faster time. In the interest of being as fair as possible, we decided to terminate the event without recognizing the fastest time. We know that you dedicated a lot of time and effort towards achieving your fastest time possible. We sincerely apologize for this matter, particularly because the vast majority of people played fairly. NES Remix is on the Wii U eShop for $14.99. Nintendo has not announced any plans for other NES Remix contests.